Yes indeedy, folks, it's Groundhog Day! 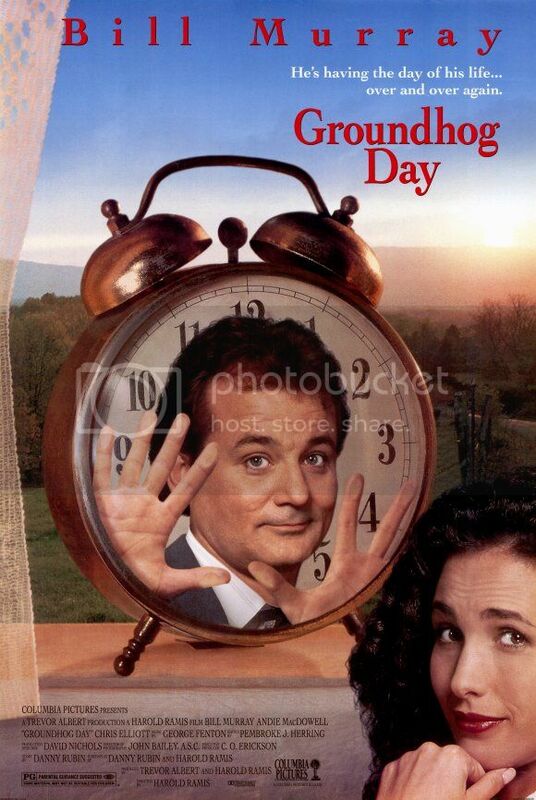 And what better film to review than the wonderful Groundhog Day! One of those Perfect Films that is not only technically perfect, but also tremendously lovable. Groundhog Day, for our non-American readership, is the peculiar American festival that takes place every February 2nd. On this day, the groundhog - "Prognosticator of prognosticators!" - crawls out of his hole and either sees or doesn't see his shadow. Based on this, we know whether we'll be getting six more weeks of winter or not. Groundhog Day, the film, is a relentless avalanche of wit and wisdom, as misanthropic weatherman Phil Connors (Bill Murray, in one of his best performances. eva.) gets stuck reliving the same Groundhog Day over and over... and over... and over again. And again. And again again again. While everyone else seems to be experiencing the day for the first time, Phil is stuck in a time loop: he moves forward, time does not. At first, Phil runs wild. He gorges on sweets, punches the annoying insurance salesman Ned (Stephen Toblowsky), picks up ladies and has zany car chases with the police. He spends an indeterminate - but no doubt inordinate - amount of time trying to pick up his gorgeous producer, Rita (Andie MacDowell, in a fresh, light performance). When tiring of all that, Phil despairs. He stops shaving, stops getting dressed for work, starts killing himself day after day after day. But it's only when Phil starts shedding his cynicism and helping others that things start to look brighter for him. This film has been claimed by various religious groups - most often Buddhists. The cyclical story with its spiritual overtones certainly lends itself to such an interpretation. And the writing by Danny Rubin is clever enough - with layers upon layers of symbolism and parallels and just plain puns - that there certainly must have been an ulterior, philosophical motive. But the genius of the film is its wit: it is deep message bottled up in a light and frothy champagne. The comic timing is perfect - just watch the repeated sequences as Phil perfects (and perfects and perfects) his pick-up lines. In fact, Bill Murray's performance is notably good here as well: lots of laugh-out-loud moments. It was also zany and meta to watch the actors repeating their lines; a commentary on filmmaking, perhaps? Or our own chats at work? OR LIFE?! Whatever way you want to take it - as a deep dharma text or as a bubbly comedy to brighten up dreary Pennsylvania Februarys (or Massachusetts Februarys, for that matter) - this is a great film. Highly highly highly recommended, regardless of the time of year.